Raoul Walsh made some iconic films in his time (White Heat and The Public remain two of the touchstones of the gangster genre). This 3D western...is not one of those. 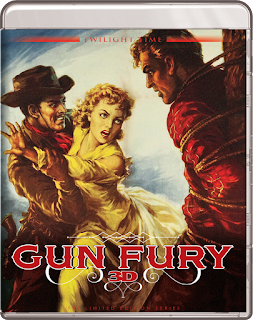 Made near the end of his long career, and starring Rock Hudson and Donna Reed, Gun Fury is a pretty standard issue genre picture about a former Union soldier left for dead after a stagecoach robbery, who rides out to take vengeance on the former confederates (remember when they were the bad guys?) who kidnapped his fiancee. The hokey 3D cinematography has left the film tinted an odd shade of blue, but beyond its cosmetic issues, the film just isn't that interesting. Hudson is a strangely bland hero, Reed a lifeless heroine. Only the villains provide any real life to the proceedings - with Philip Carey and a young Lee Marvin chewing the scenery as two of the heavies. The problem isn't that it's bad; it's a perfectly serviceable western adventure, but it never rises above the level of a middle of the road shoot-em-up that feels decidedly mediocre. On the surface, Michael Winner's Lawman appears to be a typical western template - a group of cattle rustlers guns down a man during a drunken, rowdy night, and are pursued by a straight-shooting marshal (Burt Lancaster) who is determined to bring them to justice. What isn't typical is the subtext that Winner (Death Wish) weaves throughout this gritty morality tale that is made up more of shades of gray than black and white. Lancaster's titular lawman, Jared Maddox, is judge, jury, and executioner, more concerned with gunning down his targets than actually bringing them in for a trial. His targets, under the employ of a wealthy cattle baron, are willing to negotiate, as the patriarch has had enough killing on both sides. And the town's marshal, Cotton Ryan Cotten (Robert Ryan), is on the baron's payroll and so tired of bloodshed that he would rather avoid rocking the town boat than seek justice. Lawman is a tale of police brutality and small town corruption as much as it is a shoot-em-up western, a film where no one is truly good or truly bad. Rather than give us stereotypical western outlaws, Winner paints the story's villains as three dimensional people, so much so that we often find ourselves sympathizing with their plight. And while Maddox appears to be a pillar of lawful virtue, he is almost a terrorist in his own right, descending on the small western town like a deadly whirlwind, bringing violence to their once sleepy streets. 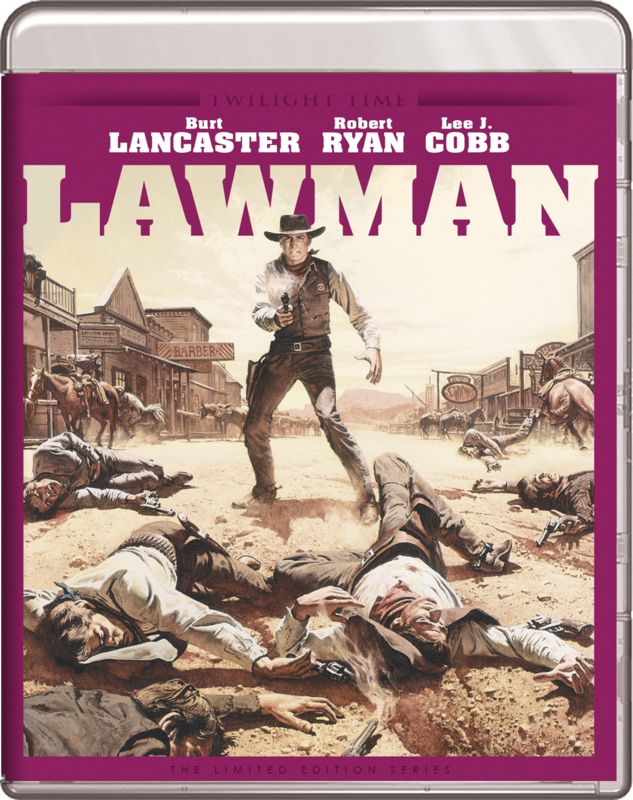 One could read the film as just another western of lawful good versus chaotic evil, but Lawman is so much more than that. It almost presages Unforgiven's elegiac take on the genre's violent implications, acknowledging that just because someone wears a badge doesn't mean they're the hero. Everyone is in love with someone, but no one is in love with the person who is in love with them in Woody Allen's achingly beautiful September. Overshadowed, perhaps, by Hannah and Her Sisters from the previous year, it is an often forgotten gem of Allen's career. Modeled after the unrequited romantic entanglements of Chekhov's Uncle Vanya, September is arguably one of Allen's most emotionally astute dramas. Gone are Allen's neurotic hallmarks (although the film is not devoid of humor), focusing instead on the deeply human wants and desires of his characters. The story centers around Lane (Mia Farrow), a woman recovering from a suicide attempt at her family's vacation home. She is in love with Peter (Sam Waterston), a struggling writer, who is in turn in love with her best friend, Stephanie (Dianne Wiest). Too busy to notice that the kind older gentleman next door (Denholm Elliot) is also infatuated with her, Lane spends the weekend warring with her overbearing mother (the incomparable Elaine Stritch) and her distant father in law (Jack Warden). Allen shifts between the wants and needs of each character, exploring their deepest desires and their most private faults. Each character feels fully developed and completely real. It's one of Allen's most free-flowing films, drifting in and out of each character's story without a strong central plot, drawing us into their unique stories before reaching one of his most beautifully burnished crescendos. 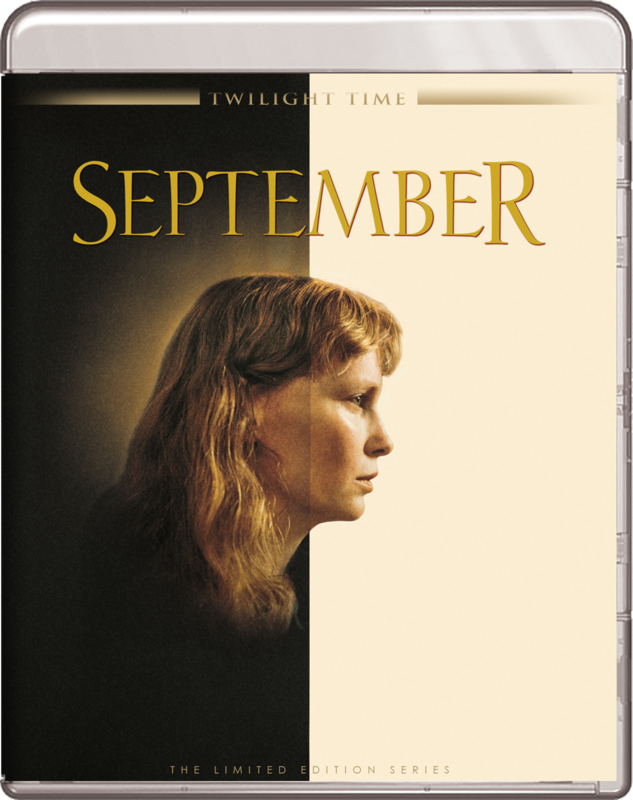 It's telling that the film is called September - the first month of autumn, as each of the film's characters seem to be poised at a crossroads in their lives. It is a film that feels haunted by sense of inevitable change, of passing time and chances fading away, like summer turning slowly into fall. Allen's writing has never been better than it is here, crafting a lovely and knowing look into the very nature of attraction and the self-sabotage that often goes with it. September is an incredible film, and perhaps the most beautiful and moving film Allen has ever made - a perfect storm of acting, writing, and direction that subtly seeps into the heart and lingers long after the credits have rolled. A little known but hugely powerful triumph. A group of young space-campers are accidentally launched into space in Harry Winer's 1986 adventure, SpaceCamp. Lead by Andie Bergstrom (Kate Capshaw), an astronaut who is stuck teach kids at the camp while impatiently waiting for her chance to go to space, the kids must learn to work together in order to survive their dire circumstances, and return the space shuttle to earth. It's an outlandish scenario, of course, but a spirited adventure, nonetheless, featuring a delightful score by John Williams and a great group of kids that includes Leah Thompson, Tate Donovan, and Joaquin Phoenix in his film debut (here credited as "Leaf"). 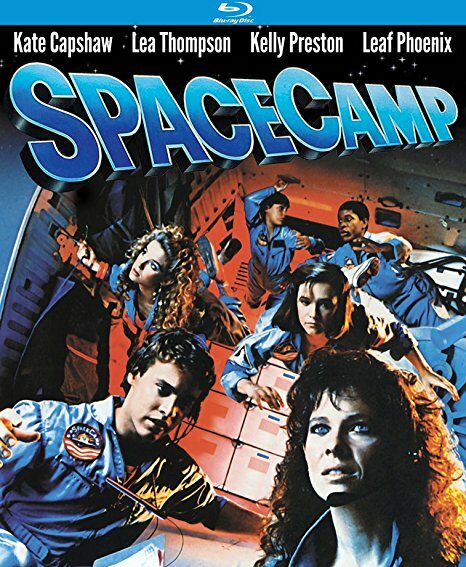 SpaceCamp was a box office flop in 1986. Its release was delayed for months due to the Challenger disaster earlier that year (due to a similar malfunction as the one that causes the accidental launch in the film), and when it was finally released, audiences just weren't ready for such a lighthearted film about something that had so recently turned to tragedy. Still, with some time and distance, SpaceCamp has proven to be a charming and highly entertaining film, that captures the childlike thrill of space travel through the eyes of those whose wide-eyed dreams of becoming astronauts at last become a reality.